By Doug And Deb S.
"Everyone we dealt with was very polite and interested in helping us. We were kept well informed." Everyone we dealt with was very polite and interested in helping us. We were kept well informed. "Everyone associated with your company has been a pleasure to work with. It's apparent customer service and quality work are the..."
Everyone associated with your company has been a pleasure to work with. It's apparent customer service and quality work are the hallmark of your company. These attributes are more rare these days. Keep up the excellent work. Thank you. "I called several other companies. None of them responded. Ayer's not only responded but sent great crew and sales person. Thank..."
I called several other companies. None of them responded. Ayer's not only responded but sent great crew and sales person. Thank you. By Kellie And James Z. You want your home to be safe and secure; Zach’s goal is to ensure it is by leveling and lifting any uneven concrete. 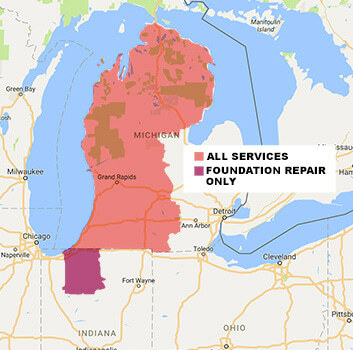 Bringing a comprehensive, personalized approach to every job, Zach will evaluate your areas of concern and provide a solution to quickly and effectively stabilize your sinking, settling concrete. Zach’s customers recommend him and the Ayers Team to their family and friends. Zach currently attends Grand Valley State University. His past experience in the construction industry includes working with concrete, asphalt, and pipefitting. Zach also completed extensive training to evaluate your waterproofing, foundation, and crawl space repair needs. In addition, as part of the service team at Ayers, he responds if you need help after installation and to do annual maintenance. Originally from Potterville, Michigan, Zach currently resides in Grand Rapids. He is an outdoor enthusiast enjoying fishing, kayaking, hiking, and snowboarding. Traveling is a passion of Zach’s, exploring new places. Family is important to Zach and he enjoys spending time with his mom, brother, and sister. Zach is looking forward to meeting you. Pool decks can be dangerous as is when wet, but imagine what they can do when they have unsafe cracks in them. We know how to fix that problem for good with PolyLevel. PolyLevel is an advanced polymer based foam that we blast into the concrete through tiny holes to make the concrete more level and stronger. PolyLevel worked to raise and level out the concrete slabs while dealing with the weak soils below that were no longer able to hold the weight of the home above. We drilled multiple small holes into the concrete slabs in order to inject them with a polymer material that expanded to lift and level out the concrete. Once injected, the system only needed about 15 minutes to fully cure and the slabs were then stabilized and lifted to their proper level, and stronger than ever before. Now, this homeowner will not have to worry about this ever again. At one of our Ayers Basement Systems expos, we met Tom and found out his crawl space needed a little help. With the help of CleanSpace, we are able to transform crawlspaces for good. CleanSpace helps to act as a vapor barrier between your crawlspace and the ground it sits on. Separating this allows for relative humidity to go down, provides more insulation, and also gets rid of a lot of those creepy crawlies. Combine CleanSpace with SilverGlo wall insulation and you have an energy efficient solution that will save you lots of money over time! We do many PolyLevel jobs because the concrete is resting on poor foundation soil. However, this is not always the case. If you have read any basement job that we've written about, you know about how damaging water is to concrete, brick, and stone. So when water reoccurs on a slab of concrete, the slab will move around a lot. This homeowner has the downspout from the roof leading straight onto the walkway, which in return has made the walkway unlevel. We did two things to fix this problem permanently. First, we fixed the downspouts by adding buried downspouts which will direct the water away from the home and away from the walkway. This will also be more discrete because it is underground. Next, we installed our advanced polymer injection foam, PolyLevel. PolyLevel worked to raise and level out the concrete slabs while dealing with the weak soils below that were no longer able to hold the weight of the home above. We drilled multiple small holes into the concrete slabs in order to inject them with a polymer material that expanded to lift and level out the concrete. Once injected, the system only needed about 15 minutes to fully cure and the slabs were then stabilized and lifted to their proper level, and stronger than ever before. Now, this homeowner will not have to worry about this ever again. We received a call from Tom in South Haven saying that his driveway has been sinking. After going out to Tom's house and looking at the driveway, we knew that it was in desperate need of some PolyLevel injections. As you can see in the "Before" photo, the driveway is well below its original position. Our PolyLevel injections harness the expansive force of a structural grade geopolymer to provide fast concrete leveling, fill voids in soil, as well as strengthening soil that has poor load-bearing qualities. One thing that goes over well with our system is that the process is extremely quick. It only takes about 15 minutes to cure, and at that point it’s ready for full loading. So if Tom needed to use his driveway, he would just have to wait about 15 minutes, and after that the polylevel is cured and the driveway is ready to handly any type of weight. These homeowners in a local Saint Joseph, MI neighborhood found themselves telling their guests “watch your step” as they entered their porch. Not only did this un-even step become a liability, it also became a hazard plaguing their guests. Their family and friends suggested they replace the concrete, but James & Kellie knew this couldn’t be the best option available to them. Seeking a superior and less invasive fix they called us! We prescribed our unique product offering PolyLevel to return James and Kellie’s cement to its original position. PolyLevel raises concrete through unique qualities of expanding polyurethane foam, making it: environmentally safe, affordable, waterproof to prevent future erosion, quick and mess free, and a permanent solution! PolyLevel not only results in a solution that looks better and lasts longer, it is also less destructive to the applied surface.